This is a translation into english of an article in swedish publiced by the municipality of Örebro in september 2015. The accounting unit is three flights up in the Town Hall, here Therese Ljung works together with about 20 people. In one of the pink corridors is a door with the sign ”Archive”, inside you can find invoices from the past decade sorted in archive boxes. In total, the municipality recieves more than 200,000 invoices each year. But nowadays, almost 80 percent of all invoices are recieved electronic and paper invoices are scanned. Instead of getting invoices from the archive they can be accessed as open data, a digital archive open to all. This is where you can find the invoices from 2010 until today as open data (in Swedish). Are you curious about the other municipal open data, you can check orebro.se/psidata. This is what open data for invoices looks like. Therese is the financial administrator at the municipality’s accounting unit. The units user support provides municipal staff support in the financial system, and also takes calls from businesses and individuals that have questions concerning municipal financial issues. Therese answers questions by phone a few hours every week. Open data reduces the workload for the accounting unit. – We have an obligation to archive everything for ten years and in the past we saved every paper copy. That meant that every time someone called to see an invoice we had to go and look in the archive. Nowdays all the invoices are saved electronicaly. We began scanning invoices in 2005, so we have the past decade digitaly, says Therese. 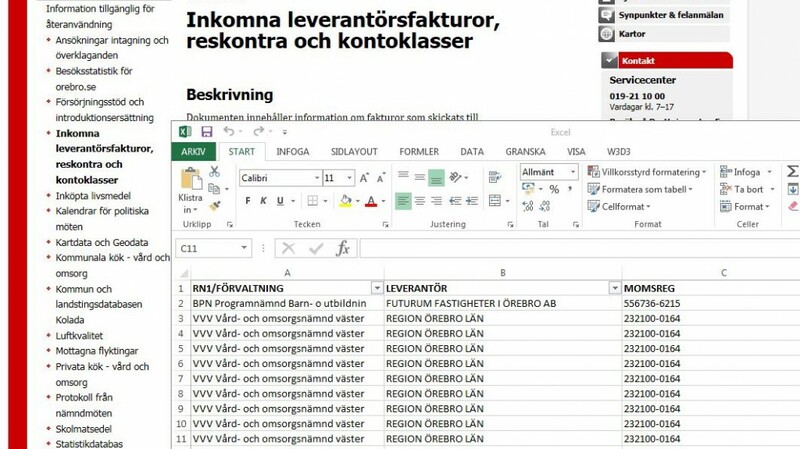 The municipality of Örebro began to open the data in 2012. The open data is (among other things) information on all invoices available as excel spredasheets. They contain information on suppliers, amounts charged, etc, but not the invoice itself. A ambition for the future is that it might be possible to publish the files with the actual invoices too. But it is difficult because some information is sensitive, such as invoices relating to social services or invoices containing names and social security numbers. – We get more specific questions after we started publishing open data, and thus save working hours. Those who call usually know what they want. They have looking at the open data first and know what invoices they are interested in. They also help us review the municipality’s accounting and that is a positive thing, says Therese. 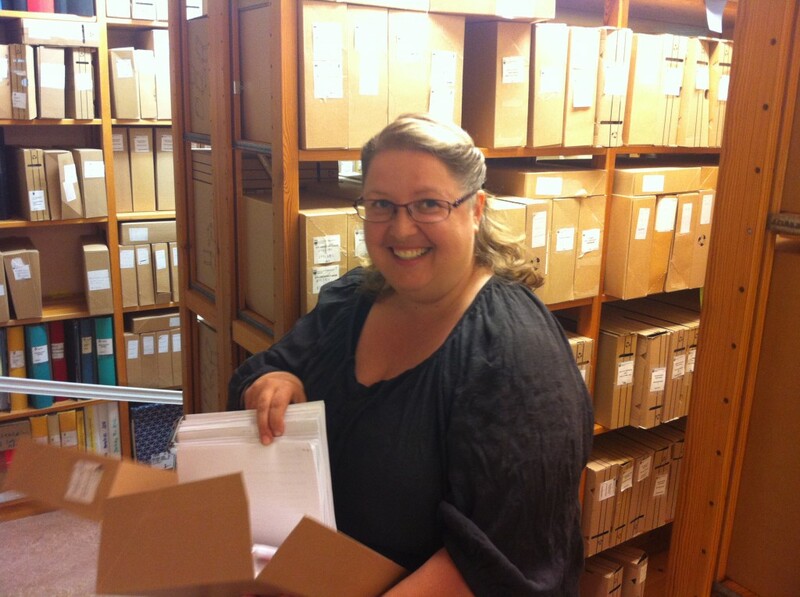 Therese Ljung shows what the old paper archive looks like – lots of paper in archive boxes and folders. A private person hears something on the news or read something in the newspaper and becomes curious. The person can, for example, call and ask how much the municipality pay for hotel night for it’s employees each year. – These amount to perhaps 1000 invoices. It is not manageable for a person to receive electronic copies of all the invoices, but often it is enough to give a sum. The sum is easy to figure out, and if the person wants to know more, he or she can go into open data and see all the figures there, and see that we are not withholding anything. Another private person looks at Uppdrag granskning (a Swedish television show looking for scandals, often within the public sector), it may be about another municipality and they want to know how the municipality of Örebro is handling the issue. – There are usually some questions after each Uppdrag granskning. For example, how much does it cost Örebro Municipality to participate in Almedalen (a popular yearly gathering of politicians, civil servants and lobbyists)? Then we gather information concerning wages, hotel bills and other expenses. Companies often get in touch regarding questions related to procurement, it may be before they make a bid or after if they want to appeal a decision. – When the Procurement Unit announces a contract and ask for bids companies get in touch. They want to check the invoices from the companies that are already under contract to find out the current level of prices in order to make a competitive bid. And after the contract has been awarded companies want to see what others are offering and if the winner really was cheaper. Open Data has created a new market for companies selling public information. And companies developing apps benefit from open data as a direct source of information. The number of companies requesting information for their clients has increased. Media, such as newspapers and television, get in touch when they do certain stories. – Most recently, SVT (Swedish national television) wondered if the municipality had reported any companies for sending false invoices to the police during 2015, and we could happily announce that we have not had to do that since December 2014.